Wow! What a Beautiful Bride! Kate has that special something! In the image above I love the way Kate holds her hands as she frames her face. Notice how her fingers gently surround her face and how her eyes almost seem to burn towards the viewer. Soft light gently touches Kate's milky smooth complexion.Finally, the background is beautifully blurred and blends with the white of Kate's veil. Those eyes! Nothing else compares to them, except possibly the diamond ring given to her by Dmitri her fiancée. Lily Rose Photography was certainly lucky to photograph such a beautiful bride at the glorious Fairmont San Francisco. Photographing in San Francisco can sometimes be a challenge but at the Fairmont, there are many opportunities for wonderful images not only inside the hotel but also in the surrounding streets. The light in San Francisco can range from hard sunlight to thick overcast fog.You are never really sure what you're going to get. In Kate's image, we found the most beautiful light right in front of a large window. The soft window light gave our image just enough contrast to show off Kate dazzling eyes and beautiful skin. One often-overlooked factor that's important in creating beautiful images is the trust the subject has in their photographer. 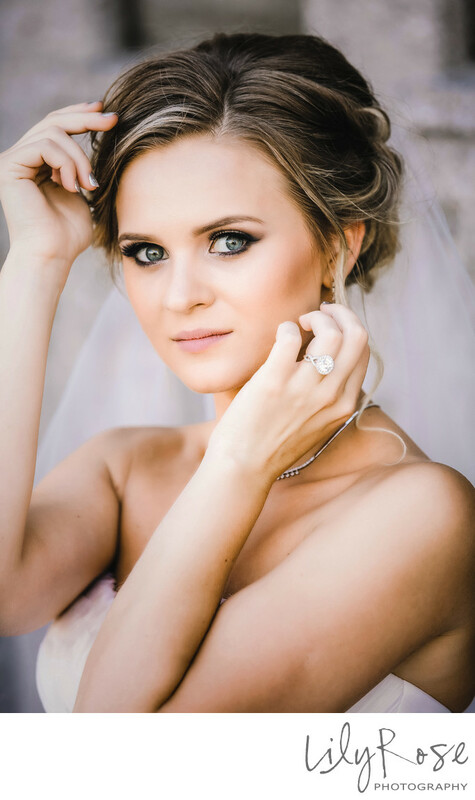 The bride must trust in the photographer to make her look her very best. This is why it's so important to have an engagement session before the wedding day.It is at an engagement session that this trust is built between the photographer and their subject. Kate's engagement session was held on a beach just north of Half Moon Bay. This seashore engagement session allowed us to make beautiful images as well as establish rapport with our client.Throughout the engagement session, we discovered what types of images Kate looked her best in and what types of images she felt most comfortable with us taking. This practice session really paid off on Kate's wedding day as we were able to rapidly move through a series of different poses that Kate not only felt comfortable in, but in which she also looked remarkably. As Kate's wedding day progressed her confidence and her poise seemed to grow with each new picture we took. This confidence radiates throughout Kate’s pictures.So much so, that her album is proudly displayed on our website as one of the samples albums that you can see! Location: 950 Mason Street, San Francisco, California 94108.